Virginia Norton has been active with The Friends of Claude Moore Colonial Farm at Turkey Run Inc. for decades. She walks back to the office after taking a walk through the farm. -The beloved farm is closed amid allegations of mismanagement. Claude Moore Colonial Farm, is a U.S. park in Virginia recreating and re-enacting life on a tenant farm circa 1771. The Friends of Claude Moore Colonial Farm at Turkey Run Inc., a privately funded foundation, pays for all activities on the farm, while the land is owned by the National Park Service. NPS is canceling the agreement and pushing them off. 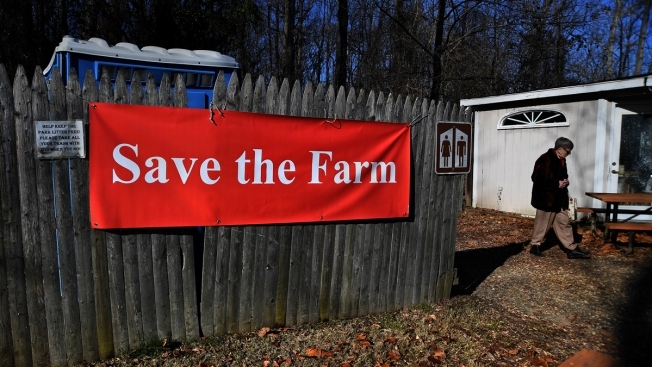 A colonial-style farm in northern Virginia is slated to close amid a years-long dispute with the National Park Service. The Washington Post reports the nonprofit group that manages Claude Moore Colonial Farm on federal land rejected an agreement offered by the National Park Service that would have initiated increased oversight. The farm and Park Service had clashed over the farm's funding and a 2015 report that questioned the farm's maintenance, safety practices and financial relationships with private contractors. The 77-acre living-history museum dedicated to depicting lower-class colonial life will close Friday, barring a last-minute agreement.